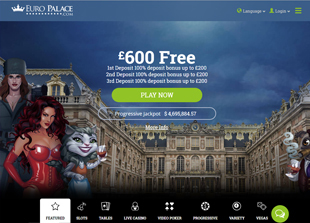 Euro Palace Casino suggests you to merge into the fantastic world of online gambling, and play video poker or other games without leaving your home. This casino was established in 2010, but within less than two years the developers introduced over 600 games powered by the popular Microgaming platform, which is a really stunning result. The incredible average payout percentage of 98.03% makes this casino a rewarding way to enjoy your favorite gambling games. They also offer you several attractive bonuses including up to 100% up to €/$600 Welcome Package, so that you could make your first bets and try their magnificent graphics and gameplay. As this casino works with Microgaming, they don’t accept USA players, unfortunately. The wagering is 40x. 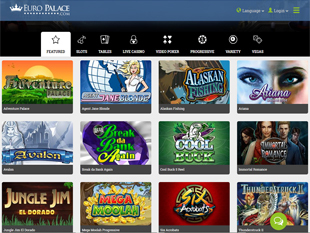 At Euro Palace Casino you can also participate in daily and weekly Slot Tournaments. You can try your luck not only with two exclusive Euro Palace tournaments – Master 1 and Master 2, but also with different network championships like Extender, One-Shot and Reloader. Such contests have amazing prize pools weekly. Like in most online casinos, here you can become a member of VIP Club, which is a loyalty program awarding you extra bonuses, participation exclusive events and special treatment. The VIP status depends on your monthly wagering, and has to be claimed by filling in a brief form right on Euro Palace Casino web page. 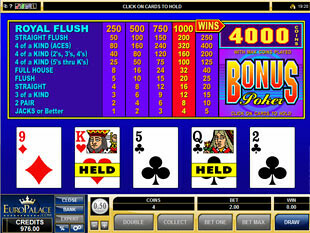 In this casino you can try more than 600+ modern games of chance powered by Microgaming. All of them will give you the precise feel of staying in a real gambling palace. The powerful platform adds to the games several special options you can hardly enjoy with other developers. 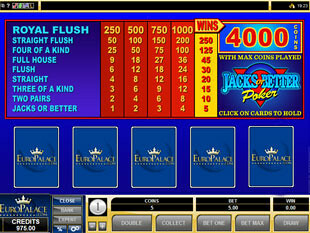 If you try this great casino, you will stay its fan for a really long period of time, no doubt. 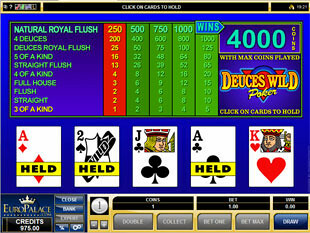 Video poker lovers can enjoy over 50 different versions of this incredibly popular card game. 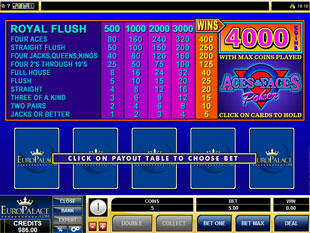 The most popular pokers like All Aces, Aces & Faces, Bonus Poker, All American, Jacks or Better, Deuces Wild and so on can be also played in special Power and Bonus Poker modes, which are featured Microgaming offers. The payment options in Euro Palace are Neteller, Instadebit, ECO, Moneybookers/Skrill, Ukash, UsemyBank, Visa, Maestro and some more. Most of them will also offer you fast withdraws, so make sure, all winnings will be in your pocket really soon.